Screen Test - Line out video from Paul Sermon on Vimeo. 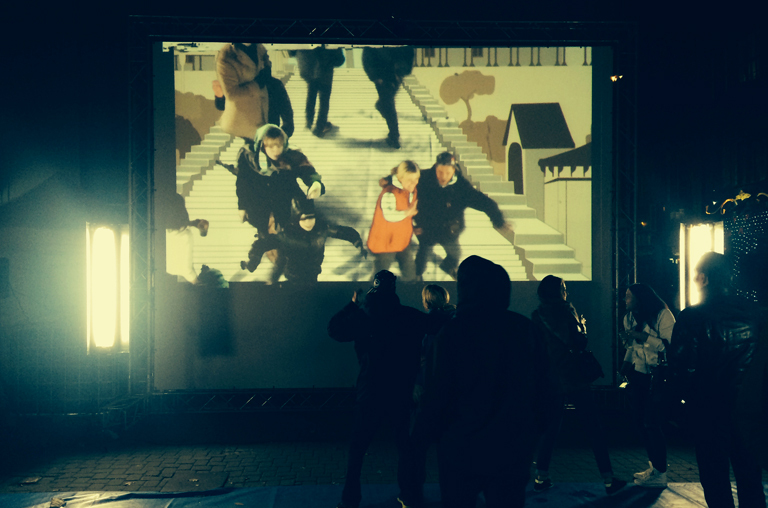 Screen Test is a site-specific work for Staro Rīga, a festival of light taking place during the Latvain independence celebrations and as part of the European City of Culture 2014 programme of events. This work celebrates the history of cinema, with key moments recreated as sets with references to cinematic genres, containing converged scenes and sets from the history of cinema including George Meliers "La Lune", Eisensteins "Battleship Potemkin", "Casablanca" and "Vertigo". The installation takes live oblique camera shots from above the screens of two separate audience groups in Riga, both located on large 40m2 blue ground sheets, which then combines them on screen via a chroma-key video switcher in a single composited image. As the merged audiences start to explore this collaborative, shared telepresent space they discover the ground beneath them, as it appears on screen as a digital backdrop, locates them in a variety of environments. Through these playful environments the audience participants are offered the opportunity to direct and change the outcomes of this installation through an open system of interaction. These unique transitory outcomes rely entirely on the roles and performances the public participants bring to these urban screens and the experiences they choose to live out. Contextualized by their urban and commercial environments and recontextualized by a diverse array of interactive backdrops, our aim is to allow these public audiences the opportunity and agency to reclaim these urban screens.